If you’re looking to start a low-carb diet, perhaps you’ve been looking for some healthy recipes. This article provides a simple low-carb diet meal plan for seven days and features 21 meals. In detail, the plan is a relatively high fat and protein diet and contains less than 50g net carbs per day. No pretenses; there are no gourmet-style gastronomical delights here, and it’s all about a simple introductory plan. However… while the meal plan emphasizes simplicity, there are still many tasty ingredients! Below you will find the sample low-carb diet menu for seven days, including breakfast, lunch, and dinner ideas. 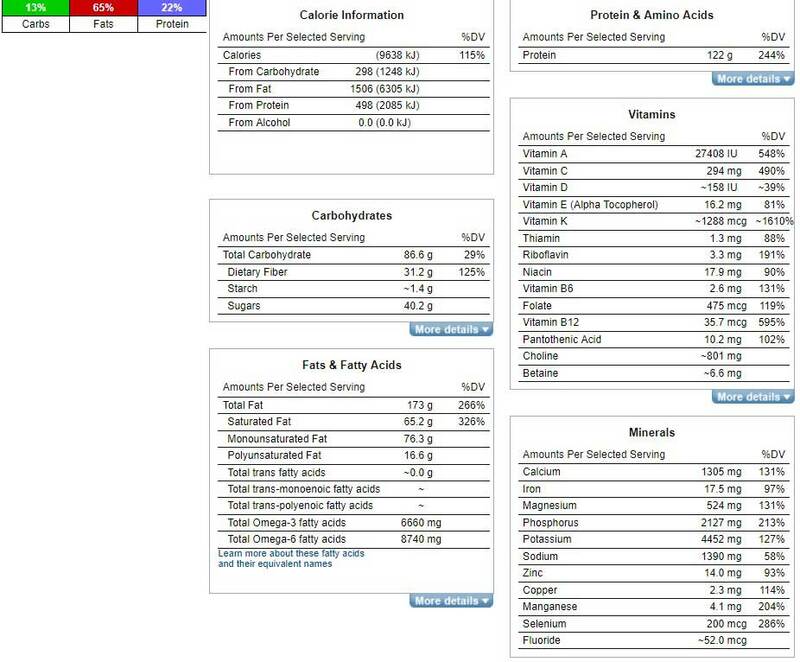 You can see the nutrition data for each day; clicking on the image will zoom in without leaving the page. The total amount of food may be too little or too much for you – don’t be afraid to monitor satiety and adjust accordingly. While the calorie count varies each day, it levels out over the week at an average of 2000 calories. Condiments are your choice; sodium is low so don’t forget to salt your food liberally, and use any condiments or seasonings you desire. However, don’t forget that this is a meal plan for low-carb – sweet sauces will ruin it! Tip: Indian spices and Italian herbs are both excellent flavor enhancers. 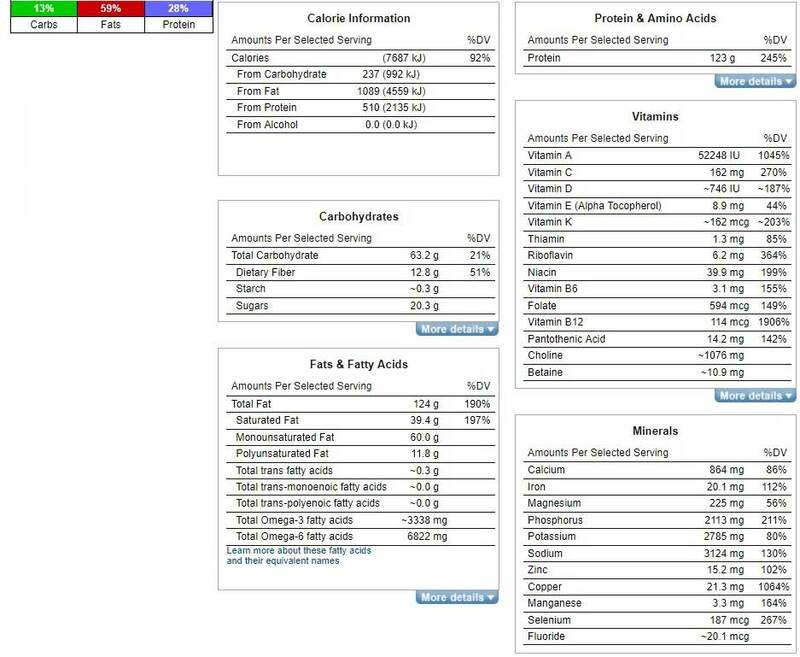 You can see the average daily intake of carbohydrates, fat, and protein at the end. The data also provides the average omega-6 to 3 ratio over the week. The meal plan is designed to be around 50g net carbohydrate or under per day. Feel free to include more or fewer vegetables depending on your target! Keep an open mind; the idea that breakfast has to be cereal or toast is a relatively new idea, and traditional breakfasts were good home-cooked meals. For some ideas, see here; examples of delicious low carb breakfasts. The first day features the classic low-carb breakfast; bacon and eggs. As a low-carb meal, this one is hard to beat in the taste department. There are plenty of high-protein foods in today’s meal plan, which is essential for satiety and appetite regulation. Also, note that the omega 6 to 3 ratio is a little high…. but don’t worry, it’s the average over the week that matters. Wednesday starts with a treat in the form of a crustless cheese and bacon quiche. This low-carb breakfast is hard to beat! Beef liver is probably the most nutrient-dense food that can exist on a low-carb menu. Although organ meats might look a little scary, they’re one of the healthiest things you can eat. Avocados are one of those foods that almost everyone loves, and every diet portrays them as health food. The low carb diet is no different, and avocados provide an enormous amount of beneficial nutrients. Today isn’t a good day if you’re a zero carbohydrate fan, but sweet potatoes are an acceptable food for moderate low-carb diets. A meal plan without chocolate would be depressing, and Friday’s low carb lunch includes some dark chocolate. While this one is 90%, the choice is yours – but 85% or over is best! For me, today’s low-carb dinner is the best of the week. This meal is finger food at its best, and the combination of French cheese, cured meats, olives and wine is a great treat. The last day of the meal plan ends with a delicious low carb dessert – strawberries and cream. 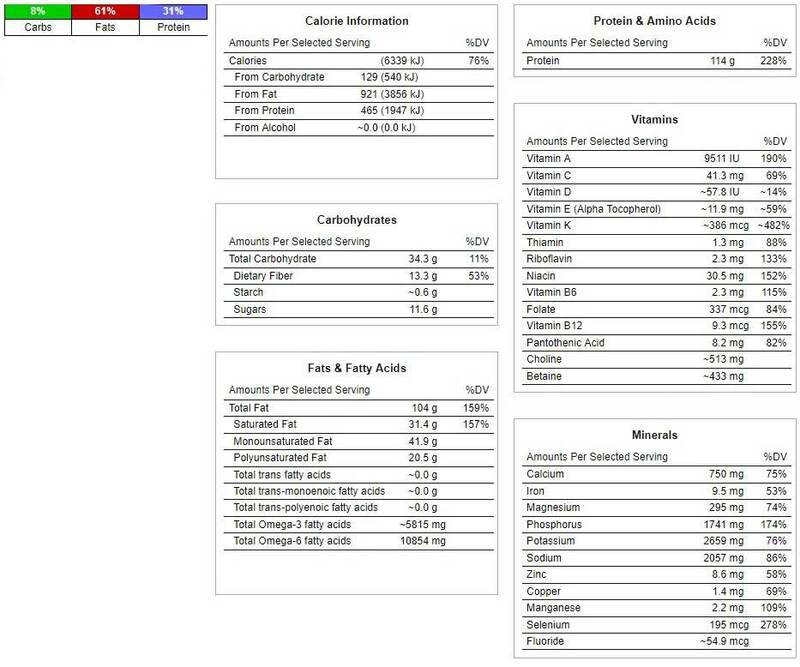 This table shows the average daily intake of macronutrients over the full seven days of the meal plan. Also, the omega-6 to 3 ratio of a diet is very important for optimal health and the table shows the average. As shown above, the meal plan provides 42.75g net carbs per day on average. There is a decent amount of fat and protein, and the omega-6 to 3 ratio is slightly over 2:1. Below you can see the foods you will need to follow this meal plan; however, feel free to change, remove or modify ingredients if you wish! While this may be quite an outlay at first, buying in bulk will provide value and means many ingredients will last for several weeks/months. 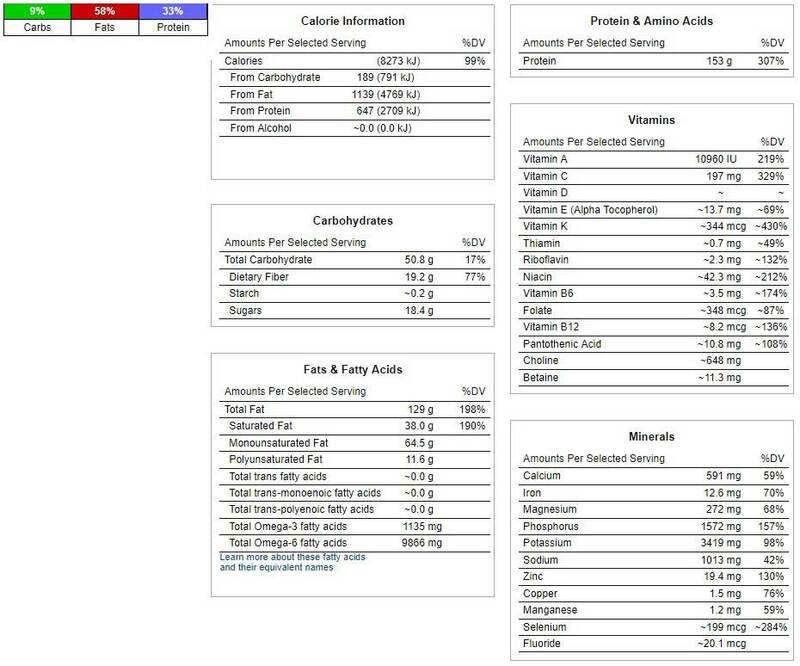 For more help in knowing what is (and isn’t) low-carb, see this guide to cutting carbohydrate intake. Fruit; while there are no restrictions, try and emphasize low-sugar fruits like berries. Fruit juices; avoid all juices whether 100% fruit or not. Starches very high in carbs such as potatoes; the occasional sweet potato is okay. Sugar of any kind; agave, cane sugar, corn syrup, honey, and maple syrup are all off limits. The foods to emphasize on low carb are dairy, fish and seafood, fruit, healthy fats, meat, nuts, seeds, and vegetables. Shortening; this industrial fat historically (and sometimes still) contains significant amounts of trans fat, and the ‘Crisco’ brand products are some of the most famous. Despite various trans-fat free reformulations, this is a highly processed, industrial fat to avoid (1). Trans fat; one of the very worst things you can eat – avoid anything listing “partially hydrogenated oil” as an ingredient (4). Drinks should be noncaloric on this low carb meal plan. Adding a bit of heavy cream to a black tea or coffee is no problem, providing you use moderation. For a full look at low carb drink options, see this guide. It is also possible to consume alcohol if you want, and dry red wine and spirits such as whiskey are the best low-carb options. While light to moderate drinking may hold health benefits, moderation is key. What Snacks Can I Eat? Personally, I recommend not to snack and to limit food to your daily meals. However, there is a range of delicious low carb options that you can eat if you feel the need. Berries and cream, dark chocolate, fruit, and nuts are all healthy and delicious too. Making smart snack substitutions when first starting low carb can be helpful to some people. As satiety improves, you can then hopefully transition away from needing them. Can I Eat Out at Restaurants? If you are out and about and need a meal, then there are many restaurants which will have low carb options. Look for meat or fish based dishes with vegetables, be aware of the ingredients, and enjoy the food. If you need a quick fast-food option, then over recent years more and more fast-food joints are offering healthier choices. Salad bowls and “bunless burgers” are good choices. Will a Low Carb Diet Make Me Healthier? Finally, you may be wondering how a low-carb diet may benefit you. First, since they emphasize and encourage nutrient-dense real foods, they can significantly improve health. However, food is not the only thing to consider. It’s important to realize that optimal health depends on our overall lifestyle and not just what we eat. Sleep; it’s a little-known fact, but how much (or little) we sleep impacts blood sugar levels and our cholesterol profile similar to how our diet does. Exercise; exercise has many great health benefits, makes us stronger, and improves various health markers. Stress; chronic stress hormones can negatively affect various aspects of our health. As a result, managing stress and finding time to relax is important. Social Life; people are usually happier and healthier when they have good relationships with friends and family. Very informative, thank you! Can I follow this 7 day meal plan every single day? Thanks Mike, this is comprehensive and detailed enough. How about adding some cinnamon or cocoa to the black coffee? Any health benefits -what do you think? Cinnamon and cocoa are both full of benefits – and they are quite tasty too!